I along with millions of conservatives around the country are furious with the Republicans’ surrender in the Senate today! We listened to Republican promises to curb spending, restore our liberties and stop President Obama’s illegal executive orders regarding immigration. We helped them win the Senate in November; giving them the largest majority in the House and Senate since WWII. Hopes were high. However, instead of seizing the power they had been given by the voters, Republican leaders have timidly continued business as usual. In December, kowtowing to Democrat spin on shutting down the government, they passed a trillion dollar spending bill with the promise that in February they would stop President Obama’s illegal executive amnesty with the Department of Homeland Security (DHS) funding bill. But now, as the deadline for funding DHS approaches and the Democrats have filibustered (four times) a bill that would fund DHS except for Obama’s Illegal Amnesty, the Republicans are again showing their lack of resolve. Senate Majority Leader, Mitch McConnell, has revealed his feckless leadership and instead of holding the line on defunding executive amnesty, he is offering a “clean bill” to the Democrats on a silver platter. They are holding all the cards and yet they are folding! According to exit polls, 75% of Americans reject Obama’s executive action. So Republican leadership didn’t merely let down their party, they abandoned their country. Whether Mitch McConnell’s feeble stewardship is due to cowardice or complicity, he has embarrassed and weakened his office, his party and our nation. Some people you can walk over and live to tell about it. But you don’t do that to people from Wetumpka, Alabama. Maybe Becky Gerritson should really be Senate Majority Leader. Then again, even my guinea pig, a spineless rodent if ever there was one, has bigger gonads than the collective Rupublican senators (also spineless rodents coincidentally). And why doesn’t the Legislative branch *snort* just hand The Occupant his crown and scepter and go home? Why should we pay those losers? What’ve they done for us lately? When I was young, I used to wonder how it would be that the world would just hand itself over to Antichrist someday. Now I know. I think Eric Erickson summed it up nicely at RedState. The new Republican Congress is inept. What is Mitch McConnell’s raison d’etre? A complete waste of human flesh. But is Boehner all that much better? They’re both a waste of skin. Makes me long for the days of yore, when they had hangings by irate crowds with torches and pitchforks. Shyeah, you got that right. Good times. Not every lynching was an injustice. We don’t really need a third party. We need a second party. He’s just as bad as we’ll soon see now that he isn’t as constrained by his right flank after 2014. He does however, have less room to maneuver in this particular instance as many of his new as well as previous members ran hard on curbing Obama’s lawlessness. Republican 2014 winners don’t run again until 2020 including McConnell. They’re no doubt counting on time to shield them. We do need a new party. What we don’t need is the one big one we have now. Yes, and given that, we have to ask ourselves what is in it for these guys that they would sell out their constituencies – and the entire country – at this point? There is zero reason for them not to take a “stick it to the man” approach right now, which the peeps would love, and would set up Scott Walker for a cake walk into the WH. Clearly, they know something that we don’t know, and that we’re going to be blindsided with before 2016. How about…oh, I don’t know…a huge economic fail followed by martial law? Or some other pre-planned horribleness, no doubt. They fear the media and the democrats more than they fear us. We’re never going to get enough of the ”right people” in office to do the ”right thing”. What we need to do is figure out how to incentivise doing the right thing by even the wrong people. Here’s a thought. That is why it is imperative to vote TP this 2016 election, if ever we get to that year. Remember, we still have 1yr. 9 mo. or 693 days to contend w/ Obama’s bumbling policies. If we have voted TP last election (2014), we would have had a TP senate majority leader and a TP House speaker. They would have crossed the Rubicon w/ regards to executive amnesty. We already have one. It is the movement called the Tea Party. All it needs is a strong personality that could meld its different views and opinions. The ”Tea Party” is/was a movement, not a political party. It’s hopes have always been far too invested in the Republicans who have co-opted a large part of it. Much of it has become about the money and is developing into just another part of the professional political class. After the failure to stop Obama care, which demonstrated the limits of a protest movement, it overestimated the success of the 2010 victories and relaxed somewhat, when it needed to double down on holding the new Republicans to their promises. For the Tea Party to be an effective alternate party today it would have to have started working to that goal in 2010. If the TP couldn’t replace McConnell in the state primary, how would they replace him in the Senate? The bill now goes to the House/Senate conference committee, where the House language on immigration will be restored. Then it returns to the Senate, for vote under reconciliation rules, which cannot be filibustered! It gets passed, and sent to President Obama with the immigration language included. Had Matt Bevin won the primary, and won the general election, the Majority Leader would not be Mr Bevin. The Bluegrass State has closed primaries; there is no crossover voting by Democrats, unless they re-register as Republicans. Senator McConnell won the primary by an almost 2 to 1 margin. Why is anyone surprised? The Republican Party is a center/left party with a dominant socialist wing, e.g. Boehner. Of course, the Democrat Party is a hard left socialist party with a dominant Communist wing, e.g., Obama. No Republican leader is opposed to any part of the socialist agenda nor will any Republican leader oppose its expansion. Rubbish. The problem is that McConnell and Boehner are careerist Capitol Hill fixtures who have only the vaguest policy preferences, fellate big donors, and cannot even properly manage public relations. By all appearances, most of the caucuses are dissatisfied to one degree or another but lack the cohesion to replace them. You knew this was going to happen when McConnell (with the support of Richard Burr and other wastes of space) restored ‘regular order’ rather than simply eliminating the filibuster. Capitol Hill games matter more to McConnell than accomplishing anything in the realm of policy. Republican Voter: We have no quarrel with your people. 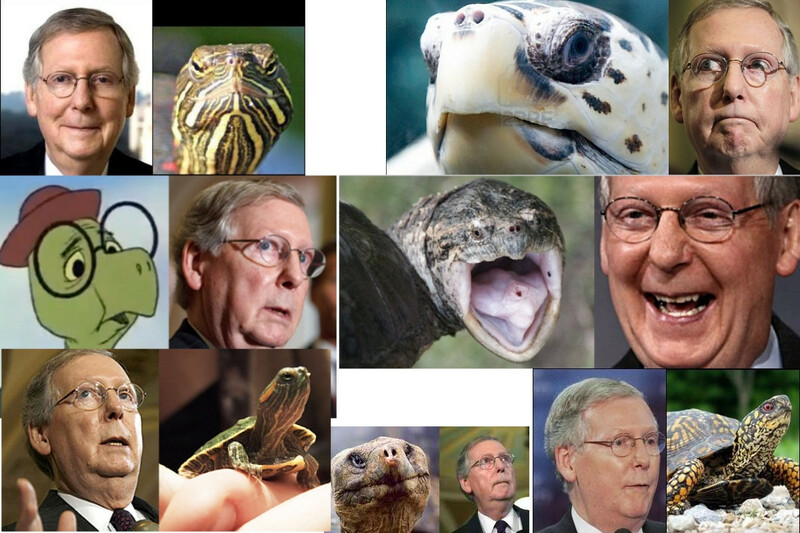 Mitch McConnell : An ant has no quarrel with a boot. Republican Voter: [dying] You’re gonna lose. Mitch McConnell: [sneering] Am I? Republican Voter: It’s in your nature. That is good news, then. Thanks for the clarification. At least, if the TP got the majority last election (2014), McConnell would be thinking twice before he stripped the executive amnesty language from the DHS funding. The GOP began as a leftist party. It has never changed its ways. Political terminology only communicates when it’s used in non-arbitrary ways. If you want to clown around, go ahead. Just do not expect people to take you seriously. If you seriously think I’m clowning around, then you haven’t looked at the history of the GOP. It was always a statist, crony capitalist party. I.e. a leftist party.